No one says it out loud—but it’s always there. If you are in a relationship with someone, and your existing relationship is the reason you are a caregiver for a parent, child, spouse, sibling, etc., your kind of care is considered “informal.” Formal caregiving, like a nurse or doctor, presupposes no prior relationship. Informal caregiving always presupposes a pre-existing and ongoing relationship and that’s when everything changes . . .
You are never only a caregiver. Informal caregiving means you are caring for someone because of a prior relationship that was once so clear. You were once only a spouse. You were once only a son. You were once only a parent. And then you add something else to the mix—caregiving—that renders your relationship distinctly different. As Donna Thomson and I talk about in our upcoming book—“The Unexpected Journey of Caring: The Transformation From Loved One to Caregiver,” this evolution is what makes caregiving so disorienting because care always changes your relationships. Informal care is what happens when the parts of our existing relationship that we hold to be sacred are trespassed by the care role. Informal care requires us to rewrite our relationships in ways we might never choose but can’t ignore. Our care isn’t formal and objective, but overwhelmingly personal, because this kind of care isn’t born from expertise but from ongoing relationships. It is our love for another that makes the informal caregiver relationship possible. Yet, informal caregiver relationships exist without clear rules and guidelines. There are no standardized protocols for these kinds of relationships. Rules make a lot of sense in the public sphere. They can be codified in advance because they are widely understood. These rules “work” because of mutual acceptance of what they mean and how they should be respected. For example, when approaching a stop sign, we don’t think about the merit of stopping, or whether it’s good to stop. We simply stop. Habits nestle deep within such rules and clarify our everyday lives so we don’t have to think every time we approach a stop sign. We just react because we know that’s what is expected of us and it’s what we expect of others. But when informal care primarily happens in the home—in the private spaces of our lives—something different unfolds. Informal care is similar to what happens when people approach a stop sign within a block of where they live. The stop sign is still a stop sign, but it’s not considered as real as a stop sign that’s in an unfamiliar place, far away from where we live. 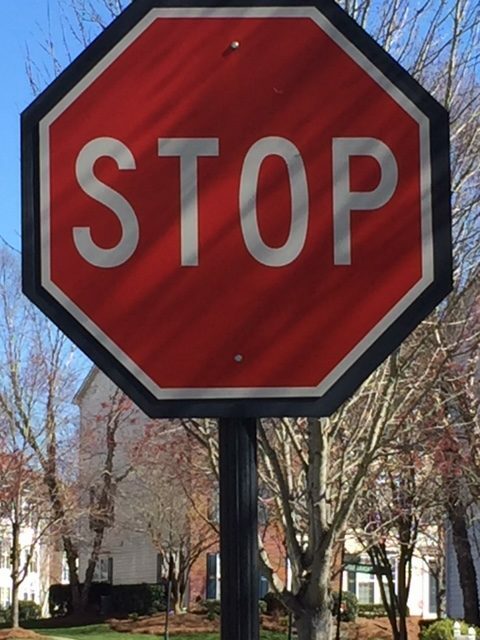 This stop sign, the one in our neighborhood, is different. We see the stop sign, but because we’ve seen it hundreds of times before and are so accustomed to our surroundings, familiarity transforms that universal rule into a mere suggestion, not a requirement. Because of the familiarity of your ongoing relational status that always accompanies your care role, you and your caregiver voice are more likely to be considered “less real” than care provided in public health settings. This is the ongoing paradox of the caregiver role. We know our care will be differently perceived and received by those closest to us, but we also know that our care is more dynamic, multi-layered, and tension-filled than possibly any other relationship we might experience. Informal care doesn’t happen apart from our lived experiences, it happens within a deeply overlapping network of relationship meanings and love and shared history that make us uniquely qualified for this most vital but misunderstood life relationship. “Who would you most want to share a meal with?” is the question. If the answer is not a celebrity or famous person, the response almost always involves wanting to share a meal with a loved one whom you can no longer laugh with, interact with, or learn from. Someone you care about who is no longer present. When caregivers hear this question, they know of another option. But it’s not an answer most would understand or feel comfortable with. What if the response to this question involves naming someone you love whom is still alive, yet different than they used to be? When most people think of conversing with another, they think of talking to one person. Caregivers, however, know that interacting with one person is a misnomer. It’s simply inaccurate. In intense and long-standing relationships, like caregiving, we are always interacting with a composite of past experiences and memories that we can’t help ourselves from bringing with us into every present, unfolding interaction. When our loved one changes because of illness or incapacity, we too are changed. The person in front of us is different than they were in the past. And if we are changed and the person we care for is changed, then our relationship is inevitably different. And what can live within this difference is a profound kind of loneliness and disorientation called relationship grieving. Giving voice to the deep awareness of what is no longer possible in your relationship is difficult to translate. If you were to proclaim the loneliness you feel when interacting with the person you care for—this very person you love so dearly—then what would others think or say? Yes, you are interacting with someone you know but you are also interacting with someone you do not know. It is in this ongoing tension that you may grieve in ways that others won’t notice because they only see what is present, not the fact that absence and presence always disguise themselves as one another for those of us in the midst of relationship grieving. Caregivers interact with their loved ones on a plane of multiple dimensions. They are never just communicating with the person before them. You are aware of multiple possibilities that most others can’t see or know. The awareness of what is happening between you and your loved one provides the foreground of your interactions and appreciation of what used to be forms the background. The challenge of relationship grieving is that background and foreground are constantly shifting. They don’t arrange themselves based on chronology. Instead, they blur into one another, defying time but always becoming more prominent and difficult to let go of when in the company of our wants and needs and desires. Relationship grieving means trying to convince ourselves that we need to adjust our relationship expectations even as we are hearing the sound of our loved one’s ever-familiar voice. The relationship habits we had originally created with our loved one don’t simply fade away. Relationship habits have to be rebuffed and silenced, time and time again, as if they live beyond us in ways that require us to repeatedly say ‘no’ to our relationship memories so we can continue to say ‘yes’ to the person we are interacting with now. Relationship grieving means believing that one smile, one laugh, or one moment of connection is evidence that the way your relationship used to be is now, again, within reach. And then your expectations go headlong into another interaction with this same loved one that sounds and acts nothing like you had expected. Hope quickly runs into perceived absence. And connection is overwhelmed by an unwavering awareness of difference. These realizations are jarring, not outwardly, but within us, as new realities seem to take away from us what we most wanted to happen between us—but doesn’t or can’t. Relationship grieving means not being able to explain why you are grieving even though your loved may be next to you. Yes, you are with someone you love but the person you are with may no longer be the person you remember. Or the person you once loved. Or the person that made possible the you and us of your relationship so special and distinct. Relationship grieving involves being constantly aware of the simultaneous presence of your loved one’s absence and the absence of your loved one’s presence. Asking this one question may just open the possibility of understanding as it recognizes that caregiver relationships don’t just change how we interact with someone we love, they also impact how we understand ourselves in our evolving relationships. People surround us throughout most of our young(er) lives. At home, we are likely surrounded by others, sharing rooms, eating together, or at least within the sound of others’ voices. At school, we sit next to peers all day and we are part of teams or activities where the “we” is constantly present. And then, one day, something changes. One day, without notice, we can’t find our peers. When we become “adults,” we find ourselves increasingly alone, looking, searching, and waiting for people we can connect with meaningfully. In the midst of life’s most challenging transitions, we realize that being peer-less is indeed perilous . . . Peer pressure is more than we once believed it to be. Too often, we put together “peer” and “pressure” without even thinking. We’ve been warned about the dangers of peer pressure. “Be careful, people will lead you down paths that may be harmful.” “If you hang out with the wrong crowd, you might be encouraged to make bad choices.” “Just say no,”is the mantra that resonates throughout our collective consciousness. But peers are more than pressure. Peers aren’t just people we randomly meet online or people whom we may happen to work next to. They are people we view as similar in some significant way. People we believe are like us in ways that make us pay attention. People we believe to be on a similar path as ourselves. People we believe are facing similar challenges. People we can look to for guidance, not because they are perfect, but because they are imperfect in ways that means something to us. A peer-less network means not only are we more vulnerable to feeling lonely and apart from the world, it also makes us more likely to feel like we have no control of how we respond to the situations that are shaping us. Finding meaningful peers—not public figures—is more difficult than most people believe. Without access to meaningful peers, we are likely to become (or stay) lost. Caregiving, grief, illness, recovery, addiction, and feeling lost call forth the need for landmarks. These essential social landmarks are not found on stages in front of large audiences. They have little to do with the number of subscribers you have. It’s much more intimate than those barometers designed for public assessments of value that show only “results,” not process. When peers are not immediately near or around us, finding them becomes much more challenging. Finding and connecting with peers—people whom we respect and value—is one of the most essential social skills that we need to lean on when we are attempting to navigate parts of life few of us planned for. It means trying to meet people as they are, not as they want us to believe they are. It means allowing others to know us as we are, not as we need others to think we are. It means reaching out when we feel most vulnerable and least likely to open ourselves up to others. This is no easy task. Peers make possible perspective—not sympathy. Only when we are lost do we begin to look at our situation with an intensity that seemed unnecessary when life made so much sense. Life interruptions sharpen our senses as we scan the environment for clues as to where we are, and possible ways we can get to where we want to be. Without others’ guidance, we are left to lean on those who wish us well, but do not know what we are experiencing. People who can sympathize but can’t fully understand the constraints and opportunities within our particular situations. Their voices are valuable and comforting, but they cannot give us perspective. No one has perspective. It’s always shared and created. Peers can hold us accountable in ways others simply cannot. The people we sit next to at work, or even in our own house, may not be our peers. Amount of time spent together and shared history aren’t necessary for someone to qualify as a peer. Peers aren’t defined as the people around us. Instead, they possess something that most others do not: our respect. People we believe we can relate to. People we look to as guides for how we want to live our lives. People whose life story stops us in our tracks, and moves us in ways others may overlook or dismiss. A response. An attitude. An endurance that speaks to us in ways that inspires. People whom we believe can understand us in ways others may not be capable of, despite their best intentions. People we respect. Peers can help protect us (from ourselves) in ways we may not be able to. If we don’t cultivate audiences whom we respect, we will miss out on realistic feedback and meaningful assessments of our goals, responses, and choices. Because respected peers can understand, they can give us permission to be more compassionate to ourselves in ways we might never allow. Respected peers give us permission to voice our faults and find value in our experiences in ways we too often will not allow ourselves to appreciate. Just as people make pilgrimages to mountaintops or ocean vistas to find perspective in something larger and more expansive, finding respected peers is necessary to help us view ourselves from a new point of view. No matter how hard we try or how much we know it would be good for us, we can’t generate different perspective(s) alone. Cultivating respected peers isn’t an option; it’s a necessity when life changes on us in ways that begins to change us. Maybe this is premature as we’ve only just begun the New Year, but I don’t think so. As most people’s resolutions have come and gone—as easily discarded and forgotten as they were created—there is something to be learned about the fascination with New Year’s resolutions. Instead of just focusing on the specifics of people’s resolutions—losing weight, exercising, saving money, quitting some unhealthy habit, beginning a healthier habit, or spending more time with family and friends—it’s important to consider why listening to other people’s goals may have left you feeling even more alone and disconnected from those around you. (1) Other people’s resolutions reflect desires and intentions, not necessities. If only 8 percent of people maintain their resolutions, it tells us more about what people want to do than what they must. Sharing common desires is important because it can bring people together. Yet caregivers do not have the luxury of not fulfilling their goals when their days are defined by daily acts of care that merit little, if any, notice. These promises aren’t necessarily optional and they can’t be neglected or ignored. Their invisible and unheralded tenacity occurs whether others notice or not. Caregivers care, day in and day out, engaging in acts of care that highlight what resolve really looks like, up close and in person, day in and day out. 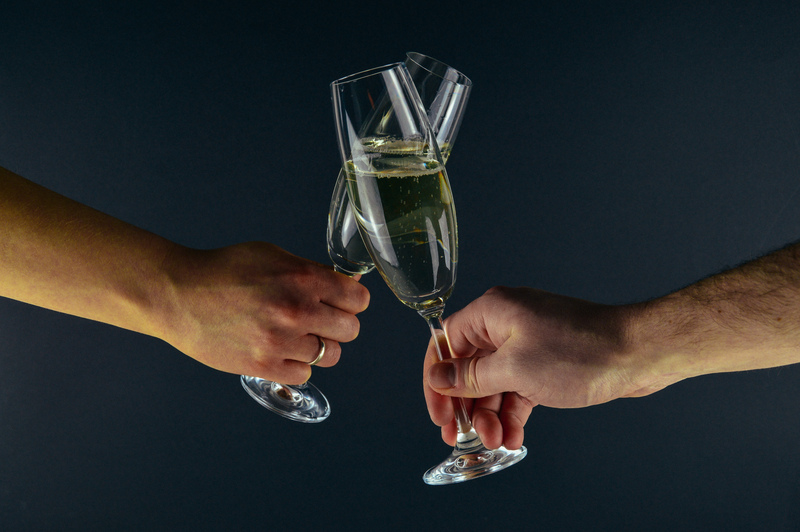 Let’s raise a glass to all who do that which is deemed necessary, not because it will mean more attention or acclaim, but because you care. And because you care, your resolve is played out by how you engage your loved ones. (2) Other people’s resolutions feature change as the ultimate state of perfection. The act of making a public resolution, late at night at a party, surrounded by others, is an alluring act of identification by which sharing is achieved by pointing out what is incomplete. Resolutions hold out the promise that change, and change alone, is the means to a better life. At first glance, this type of goal setting is admirable because it highlights a desire to work toward our better selves. Unfortunately, however, other people’s resolutions almost always reinforce the belief that the only resolutions worthy of notice are those that are seemingly within our control. Characterized by action verbs, these resolutions celebrate the fact that we can—and should—be able to change our lives. Once again, this is a wonderful gesture—except when life inconveniently reminds us that our health, or the health of someone you love, may not conform to any amount of desire or resolve. Caregivers know that gratitude, not simply perfection, is also worthy of celebrating because gratitude doesn’t depend on change as much as it asks us to see anew what is happening in our lives. (3) Other people’s resolutions are so individualistic that they leave little room for connection. “I resolve to . . .” is as much about the “I” as what follows any proclaimed resolution. Such individualistic goals ring hollow to those who recognize that the “I” is always integrated into countless relationships and expectations constantly reminding us we are deeply embedded with and amongst others. Though others’ resolutions too often emphasize their distinctive individuality, caregivers are always keenly aware of their dependence on others. Caregivers think and understand the language of the “we” and are more likely to speak of relational-based resolutions that both acknowledge their interdependence and celebrate what can be resolved together. (4) Other people’s resolutions place too much value on new beginnings rather than on continuing something you’re already engaged in. Learning a new skill, picking up a hobby, or finding another job are worthy resolutions, but they overplay the value of the new and leave little space for recognizing the value of endurance. Caregivers’ experiences remind them that caregiving doesn’t provide clean and impressive before and after stories nor do they allow you to be able to resolve to wipe away your past. Instead, caregiving requires you to constantly integrate your past into an unfolding present. Instead of raising a glass to the possibilities of a completely new you and new life, isn’t it time we begin raising our glasses to the resilience and ingenuity of those of us who must constantly reconcile our past with our present to make a meaningful now that has little, if anything, to do with newness? After New Year’s resolutions dissolve into the dawn of the never-ending tomorrow, the values caregivers cultivate daily are the values that matter most: appreciation, constancy, gratitude, the ability to create opportunities for wonder and appreciation, finding and enhancing connections with those around us, and deep resolve to endure and create value within constraints. These are the values that bind us together and ground us in what matters most, and they are the very values that can remind us that we are not alone. Although these values will almost always be omitted from other people’s New Year’s resolutions, they live with us and between us all year. When was the last time you felt deeply connected to a group of people? A deep and genuine sense of connection is becoming ever more rare in modern life. Everyone needs to feel connected, but a sense of connection is most vital when you are in the midst of a life-altering role that is transforming you and your relationships. If connection is so important, then why is it so hard for caregivers to feel as if they are a part of something larger then themselves? There is no common beginning to our most important informal life roles. Let’s face it, what experience do we set forth on, at the same time, with other people? Yes, there are plenty of marked beginnings in contemporary life, but our individual beginnings seem to rarely coincide with others’ beginnings. A death of a loved one may mark a new beginning, but not for those in your friend network. Getting laid off from work may symbolize a new beginning, but not for those in your extended family. The need to provide care for a loved one may signal a new beginning, but not for those you work with. Beginnings come at us all the time, but too often they are conceived and experienced as private and individualized experiences. School may be one of the few cultural experiences in which there is a semblance of a “beginning” that is marked and collectively acknowledged. The “first” day of school may be a singular experience in cultural life in which we begin something with others and anticipate responding together to shared experiences and challenges. Beyond school, however, much of our lives are spent trying to connect with and find others who are experiencing what we are experiencing. You may start a job at the same time as others, but even this onboarding experience can too easily become conceived as a private endeavor restricted to a one week training session that quickly fades away upon completion. The birth of a child is a clear beginning for parents, but beginnings aren’t simply about when a new role comes into existence. It’s also about what happens the day after, the week after, and months after you are initiated into a radically new role. Shared beginnings forge deeply meaningful bonds because they allow you and others to lean on a shared reference point that marks your individual and collective development. New experiences are scary because they seem to defy prediction and require us to constantly make sense of what we are experiencing without knowing what will happen next. Forging a path forward in uncharted territory requires constant awareness because we don’t know what we (don’t) have to pay attention to. Quickly, this all-encompassing focus becomes exhausting and overwhelming. But exhaustion is also a reason to turn toward others whom you believe are “in” it with you. This “not knowing” is the reason, the perfect reason, the only reason necessary, to connect with others. Shared beginnings are deeply charged opportunities for connection because they can minimize differences that you once believed existed between you and those around you. New recruits to the military or first-year medical students understand this common phenomenon as an intense type of “boot camp” experience in which who you were and what you once believed becomes less influential than the overwhelming impression that you are no longer responding alone to what is happening. You are not alone but being formed—together—by what is shaping you and others in your common circumstance. Too often, however, the costs of being separated from common beginnings has significant consequences that are rarely acknowledged but almost always felt. 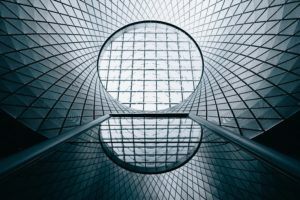 Separated from others’ beginnings, is it any surprise we come to the conclusion that what we are experiencing is distinct and unique? Separated from others’ beginnings, is it any surprise we come to the conclusion that what we are enduring is unlike what others are experiencing? Separated from others’ beginnings, is it any surprise we come to the conclusion that what we enduring doesn’t have a place to be shared or talked about? Separated from others’ beginnings, is it any surprise we come to the conclusion that what we are enduring isn’t worthy of being shared or talked about? Beginnings don’t just mark when something starts. They mark how we respond with others. Shared beginnings can be the glue of connection, essential opportunities to find and connect with others responding to similar challenges. Sometimes, integrating ourselves into a “we” means gaining parts of ourselves that we know bind us to others. Sometimes, seeing how we are being commonly shaped by factors beyond our control means finding parts of ourselves we can recognize in others. We may not be able to choose what beginnings find us, but we can choose how we think about our care experiences. International care advocate Donna Thomson and I explore this care transformation and many others in our upcoming book, The Unexpected Journey of Caring: The Transformation from Loved One to Caregiver. Learning how to allow yourself to find connection with others may be the most important step you take in your care journey because it’s not always about stepping forward as much as it is about reaching out. Most people talk about thoughts as if they come to us only in times of inspiration. A light bulb goes off. An idea suddenly comes to you. A thought passes by and then is gone as quickly as it came. Although this is how some people may experience thinking when life is going as planned, this process doesn’t come close to describing how someone in distress interacts with their own thoughts. When in distress . . .
Certain thoughts can imprint themselves on us and in us. 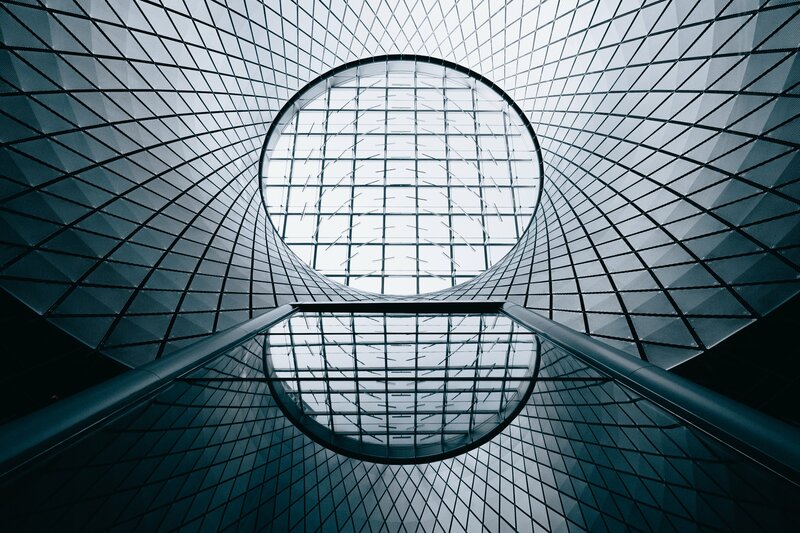 When confusion flourishes, thinking isn’t free and open to all of the world’s possibilities. No, thinking under duress is overwhelmingly restrictive, not creative. It doesn’t allow us to notice much of anything else. It conceals more than it reveals as the thoughts that come to us when we experience stress are a type of extreme focus. But this isn’t the kind of focus most people talk about. This laser focus isn’t on anything or anyone in front of you, rather on something that happened. Yesterday. A week ago. A year ago. Something or someone no one else can see, yet you can’t let go of. Something you wish you had said. A conflict you can’t forget. Words that hurt and stay with you as they play over and over in your mind without interruption. Peace of mind is elusive when so much is being asked of us as our attention is being moved in ways that we seem to have no control over. It’s as if we are always in two places at once: listening to ourselves and the person in front of us. We can try to perform this dance for a while but it’s exhausting. We can’t really listen to the person or situation before us because we’re also trying to attend to what we are preoccupied with. We see their lips move, but we don’t hear them. They see us, but they may never know what we are thinking. Certain thoughts are difficult to let go of even when we desperately want to be freed from them. When life is unfolding in ways we anticipated, it is accurate to say we are thinking about something or someone. Under the influence of uncertainty, however, we are no longer thinking about something. When we feel powerless and incapable of impacting events and situations, thoughts find us even though we don’t want them to. They turn up when the lights are turned off. They are loudest when there is a moment of silence. When distressed, we experience a paradox. We can’t seem to free ourselves from certain thoughts because the more we give ourselves to that worry, that hug we never got but so desperately wanted, that compliment that was given to someone else, the more attention it demands. And the more attention it demands, the more it grows. When we get in this mindset, we believe that if we would simply give it more time and attention, it will be polite enough to disappear into the background, if only for a short while. But that usually doesn’t happen. Ironically, the more we pay attention to certain types of thoughts, the more we devote ourselves to them, the louder they become. In the process, all that is before us becomes background noise as we become consumed with chasing down thoughts far beyond where we are. Certain thoughts can contaminate the way we think. When we are tired and exhausted, we are at our must vulnerable to become consumed with a regret, a frustration, an argument, an interaction that begins to contaminate other ways of thinking. Destructive patterns of thinking can quickly emerge in which we lose the capacity to think about what most distresses us in creative, novel, or different ways. When this happens we are not really thinking about something—from different perspectives, with reflection, checking our own reactions with the voices of others—as much as we are thinking about something in the same way, over and over again. Thinking about something—again and again in the same way—can quickly become familiar. And then, familiarity becomes normal. Over time, normal becomes expected not because it is helpful or good or accurate, but because it is what we have become accustomed to. Not all thinking is created equal. How we feel about something and what we believe we can do to improve or change a situation changes not simply what we think about, but also how we think. For those of us who are in highly distressing situations, being told to think “logically” or “abstractly” or “rationally” about someone or something, can be a type of insult because it assumes we have the luxury of stepping outside of our situations. That sounds noble, but it is often not possible. We accept the biological reality that people under the influence of alcohol and drugs physiologically respond to stimuli differently. Isn’t it time we begin accepting the fact that the influence of exhaustion and stress also means we will think differently about the situations we are faced with? 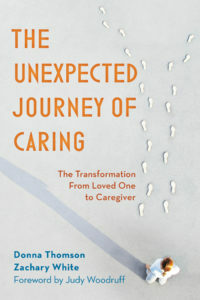 In an upcoming book I wrote with co-author and caregiver advocate, Donna Thomson, The Unexpected Journey of Caring: The Transformation from Loved One to Caregiver (June 8, 2019), this is exactly what we do as we explore the ways in which caregivers are shaped by experiences that can’t be understood apart from the influences of care, exhaustion, stress, isolation, and relationships that shape and remake who they—we—are and how we respond. tags: caregiver identity, caregiving identity, the caregiver role, what happens after care? Each of us inhabits different roles throughout life. Whereas everyone can point to a calendar to explain the last day they were employed at a particular workplace, informal roles don’t have clear endings. Too often, caregivers are unprepared to make sense of what happens when the role they occupied continues shaping them long after others believe their caregiver role “ends” because . . .
Caregiver tasks may end but not the parts of you that were shaped by the role itself. Others may believe that caregiving ends when your loved one moves into a nursing home, assisted living facility, or when a loved one dies. With this noticeable shift, you are expected to seamlessly return to your previous life. But this expectation doesn’t often fit with how you see yourself. Too much focus is on what you did in the care role and not enough attention is given to who you became throughout the process. The disparity between what you thought you would feel—one step closer to your old self with each passing day—and how you actually feel—a revisiting of unease with each passing day, can’t help but create more confusion and feelings of inauthenticity. “Life can now return to normal,” others proclaim. But what others consider normal may no longer be what you consider normal. “Now you can start over,” you are told. Start over? Doesn’t that mean denying that you were living while you were caregiving? “Now you can get your self back again,” you are reminded. But what if you don’t want to return to your old self? Although family, friends, and colleagues may sincerely believe that life can return to normal when caregiving “ends,” you know that’s not really possible. Caregiving may have radically interrupted your previous life, but somewhere along the way, it became a guide to living. You are not who you once were. Your understanding of normal has been irrevocably changed. The clarity of your caregiver role has been replaced by an overwhelming sense of ambiguity. The emptiness of not knowing what to do in response to your role change can overwhelm in ways you couldn’t have predicted. The exhaustion of care is replaced by a different kind of exhaustion: How do I explain to others that the values that I developed in my caregiver role are still with me? The clarity of knowing what was expected of you as a caregiver, however challenging, is gone. Now, the uncertainty of what you are to do without a clear and overriding purpose of care can’t help but make you doubt who you are and what you should be doing. When you were a caregiver, every day was clear in its purpose as the routines of care were the ultimate guide. Unending exhaustion was part of your everyday role, but now you find yourself exhausted by the apparent purposelessness of the everyday, not marked by life and death, pain and suffering, love and connection, but by trivialities that no longer make any sense. How do you explain that you miss parts of yourself as a caregiver, or at least the parts of your role that made it clear what you were supposed to be doing and how you were supposed to act? Care doesn’t stop when caregiving ends. Others may no longer call you a caregiver, but the impact of your experiences doesn’t just evaporate the moment your “caregiver” role is omitted from how others label you. Just when family and friends believe your caregiving role is over, you may begin thinking about your experiences in ways that may have been too difficult to comprehend when you were so deeply in the experience. Care isn’t something you can turn off immediately, or even slow down when the caregiving role changes. Though others may no longer refer to you as a caregiver, the care that made you a caregiver has no shelf life. When it comes to roles that shape how we think about ourselves, there is no clear ending point. Caregiving doesn’t end even though the responsibilities that once characterized that role may cease. Caregiving isn’t just something you give; it’s something you become. You don’t “recover” from being a caregiver because the experience has become such a vital part of who you are that to let go of that part of yourself would also mean relinquishing everything you learned in the process of caring for someone you love. Feeling lost used to be a rite of passage. Before GPS, anyone driving in a car, at one point or another, knew what it was like to be lost. That feeling of knowing where you want to be but not being able to find your way and get to where you want to go. Here, in this very moment—whether in a car or in life—something happens to us. Too often, we are so concerned about not getting lost that we rarely pause long enough to consider how feeling lost changes how we think when we are at our most vulnerable. Time acts differently. There is an urgency to being lost that is absent, or at least hidden, when we don’t have a clear destination in mind. Perhaps it’s because in the course of everyday life, we don’t always have clear goals. When we want to get somewhere in particular, however, urgency emerges. Sometimes, it’s because we feel the need to get somewhere at a specific time. But there’s also a distorted rhythm to being lost. Time no longer cooperates. It appears to go by faster and slower—taking us out of the normal rhythms that allow us to ignore time. When we are lost, we become highly sensitized to the passing of time, transporting us into a hyperawareness of how the need to get somewhere affects our body. When we are lost, time is no longer something that we look at on our watches—it’s something that begins acting on us as our body tenses up, our pulse quickens, and our breathing become increasingly distressed. In the midst of growing uncertainty, we look to time for guidance, but because we don’t exactly know where we are and how long it might take us to get where we feel like we need to be, time becomes meaningless as it doesn’t allow us to predict anything. Everything demands our attention. When we feel like we know where we are, we know what we should pay attention to and what we don’t need to think about. Mindlessly driving to work is comforting because the journey is characterized by what we don’t have to notice. Guided by habits of routine means not having to pay attention to directions, the right turn, that curve, or that long stretch of highway. When guided by habit, our bodies and minds collaborate with our environment so we can become engrossed in our own thoughts—a favorite song, a rehearsing of what might happen later that day, or replaying a conversation from the previous night. We are on autopilot. When lost, however, everything demands our attention. Everything has possible meaning. Every street name might be the path you are looking for. Every landmark might be a clue to finding where you want to be. When we don’t know where we are or where we are going, the voice in our head becomes our own navigational device that doesn’t as much give us directions as it makes us question every decision. And the longer we feel like we are lost, the more we begin to question ourselves as each decision becomes more and more important. As every choice becomes magnified, we can’t help but believe there is only one right way to get there. And if there is only one right way to get there, then yes, every action and inaction is consequential. The voice we use to talk to ourselves isn’t supportive and encouraging. It’s nasty and unrelenting. It’s usually full of contempt and almost never self-forgiving. In the silence of our own thoughts, we treat ourselves in ways we would never treat others. Our self-voice never, ever apologizes. Perspective shrinks when we are lost. When threatened by not knowing where we are or where we are in relation to where we want to be, we become single minded. Feeling lost isn’t simply about getting where we want or need to be, it’s also a statement about our incapacities. “If I can’t even find my way, how am I going to do what I need to?” “Why are the simplest things so hard for me?” “Why does this always happen to me?” “I must really be losing it.” In the process, the world around us shrinks. At the very moment when our surroundings are drowning our attention in constant stimuli, we lose our ability to see beyond our immediate circumstances. We can no longer see ourselves and our journey for what it is. It represents so much more. It—our journey, our need to find our way—becomes a preoccupation. Nothing else matters. We push down faster on the pedal. We take more risks. We don’t fully stop at the stop sign. We turn away from others. And our desire to find something real and concrete becomes our sole preoccupation at the very moment when our peripheral vision shrinks allowing us only to see what is immediately before us, distorting everything. And then we arrive at our destination. We arrive but we are different. We are where we thought we needed to be but we are depleted and exhausted. The first voice we hear startles us because it’s the first voice we’ve heard in a while that isn’t ours. The first voice we’ve heard that isn’t yelling. We are there, but we are different. And then we spend the rest of the time camouflaging the fact that it—the journey—has taken too much from us for us to share without looking silly and embarrassed. Being lost isn’t a description of a place; it’s an experience that shapes how we think about ourselves and our capacity to get where we want to be. Being lost isn’t something we’re allowed to talk about. Being lost changes us but we can’t let anyone know this because it’s a state of mind that is seemingly temporary. We admire people who always know where they are going. With GPS, we’re led to believe that being lost is out of style. Not something anyone has to worry about anymore. Unfortunately, that’s not true. People are still getting lost, every day, it’s just we no longer want to acknowledge that being lost is part of being human and it often has nothing to do with a destination, but a change in how we think about ourselves in the midst of struggle. 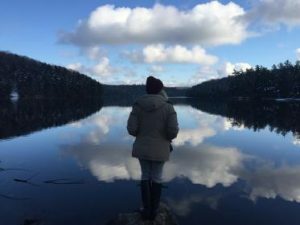 Isn’t it time to create spaces to talk not only about destinations, but also what it means to be lost? We don’t need others nearly as much when we’re at our destination, but we need each other most when we are lost and under the influence of self-doubt. We’ve all witnessed the “awkward” silence moment in the presence of another. And we know this situation is even more awkward when someone publicly diagnoses what’s happening by saying, “Wow, that was kind of awkward.” Most people can endure this so-called social awkwardness for only a matter of mere seconds. But what makes interpersonal silence so awkward for most people but not for caregivers who spend a majority of their interactions with loved ones in silence? Caregivers are open to ways of connecting that don’t require talking. Sharing space and developing closeness with another person can be accomplished in so many ways. While talk and disclosure can bring people closer together, so can shared presence. Caregivers know what most others don’t—talk is just as effective at keeping people “distant” as it is in drawing people closer. If others were able to witness how caregivers create closeness, they would walk away in disbelief. “I don’t get it, nothing happened? Nothing was said.” I heard this refrain too many times as a hospice volunteer when others would question the merit of spending time in the company of someone who may not be able to talk or to express themselves verbally. What outsiders believed must have been remarkably awkward—“I don’t get how you can spend an hour with someone you don’t know”—I knew was anything but awkward. Shared presence was comforting. The silence was sacred. And I felt remarkably connected to another without sharing one single word. Sharing the same space as another person without wanting or needing words means you are more willing to be open to a human connection that doesn’t necessitate a detailed examination of someone’s history or background or resume. Silence, with an accompanying willingness and desire to be present, says everything that needs to be said. Someone who is preoccupied with “awkward” silences fears silence for what it might reveal—about themselves and the person they are near. Silence focuses our attention in ways that no words could ever inspire because it reveals a truth that caregivers already know from their experiences. It is talking—not silence—that camouflages what we already have in common with one another. It is talking—not silence—that dupes us into believing that we need to use words to scan for possible similarities. Caregivers have a remarkably high tolerance for interpersonal silence. Most people’s instinct is to panic—exit immediately before something happens that might reveal the truths of connection that can be noticed and experienced with anyone. Caregivers know similarity always exists between themselves and another. It is just waiting to be noticed and appreciated. Caregivers know that the person in front of them—no matter who they are and how “healthy” they are—is always afraid, hurting, and uncertain too. No amount of talking takes that human truth away from us, it only temporarily distracts others from noticing—creating an unnatural and unnecessary distance between people. Connection is possible precisely when one lets go of the pressure to feel like the gaps of silence have to be filled with words when in the presence of another. When you hear someone talk about “awkward” silences, what they really mean is “awkward” presence. Unfortunately, too many people have been trained out of knowing how to be with another person. They might be quite proficient at talking to others—but quite limited when it comes to creating connection. Most people are surprised when they “find” commonality because they mistakenly believe connection is a scarce resource. Caregivers, on the other hand, expect to find connection, but realize that connection is so rare not because it doesn’t already exist, but because of an unwillingness to allow it to be noticed, appreciated, and fostered using the language of silence. Listening is the least valued, most misunderstood, and yet the most potent form of communication. Even though most people put “listening” at the top of their resumes, those of us who are in caregiver relationships know that listening isn’t just about remembering something and it surely can’t be reducible to a “skill.” No, it’s so much more than that. For caregivers, listening is vital to relationships because it is . . .
An Invitation . . . Comprehension is applauded because facts and information can be recorded and transcribed, memorized and regurgitated. But the kind of listening that caregivers engage in is distinct because it isn’t only about what is said, but what is made possible. Invitational listeners create conditions for sharing and understanding. This involves a willingness to be close enough to another person to invite the possibility for genuine and authentic sharing. And sharing isn’t only about words—it’s about an awareness of your loved one that allows them to communicate in ways most others don’t ever notice because they are preoccupied with the exchange of information. I’m not simply talking about physical presence, but a presence of attention that is open to what is possible. Openness is so scary because it means not being able to predict or control what will happen in an interaction. This is the very reason that invitational listening is so rare—it asks the invitational listener to . . . Turn away from the world—yes, someone else might be texting or calling you—by turning toward, completely and wholly, this person. Allow the spontaneity of the moments that follow the invitation to defy time constraints. Invitational listening isn’t a one-time event that can be scheduled. It’s not something that takes place in a meeting room or during an interview. And it can’t be reducible to mere information and words. 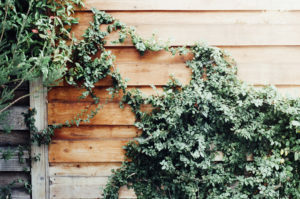 Invitational listening means a willingness to open ourselves up to another, rejecting all else around us, allowing personal agendas and convenience to evaporate into an embrace of this moment, this person, this possibility for connection—now. Listening is the language of attention, and invitational attention creates an undeniable motive for sharing and connecting in ways that too often go unnoticed. To Create Closeness . . . Listening for comprehension is great for taking tests or remembering directions but that kind of listening is too focused and restrictive. It depends almost entirely on the assumption that another person knows exactly what they want listened to as if what they were going to share were a one-time event ready for prime time. These listeners listen only to what is said in that moment, paying special attention to the new and different, the bottom line, or the main takeaway. Listening like this is loaded with conditions and can’t help but get in the way of genuine connection . . .
On the other hand, creative listening is so distinct because it isn’t about changing or editing what is shared in our presence. This kind of listening requires a willingness to be near another as they voice their fears and concerns and anxieties and vulnerabilities. To be near another during their disorientation. Not to change them or silence them or sanitize their stories and experiences, but to know that our willingness to listen to the apparent senselessness of the moment is necessary for creation, connection, and sense making. Making sense is never achieved in private. It’s always something created with another—out loud, in a shared presence of unconditional attention, over time, as drafts of our selves are shared and modified, reclaimed and revised, edited and altered. Unlike other types of listening, creative listening almost always involves awkwardness and fear and anxiety and uncertainty because this type of listening is about closeness—not comprehension. That Transforms Both People . . .
Caregivers realize that listening is always relational—an invitation to create closeness. Listening isn’t simply about paying attention to finished stories and eloquent statements. It’s a willingness to be near another as they are unfolding and the stories that once made sense are redrafted and remade. More than most, caregivers know that listening is an invitation to make something—together. Your everyday willingness to listen is a radical act because it oftentimes occurs when the world around no longer believes your loved one needs to be listened to. You—and your presence and attention—disagree. You know something others don’t—listening is transformative for both you and your loved one. Transformation through listening isn’t a public act to be seen and liked by others. Transformation unfolds when we open ourselves to being near another precisely when we have no idea what can be made and created—together. Put your head down. Keep going. Grind. Just get through it. This is what we tell ourselves when life becomes difficult. This is how we stay motivated when what we are facing is so frustrating and overwhelming that we must remind ourselves that something better is waiting on the other side. This is how we keep going when our bodies and minds tell us otherwise. When it’s over. When life gets better. When things can return to normal. If I can keep going just long enough to overcome this, then . . . Suffering is never a destination any of us would choose for ourselves. For far too many of us, however, chronic caregiving means that what we are experiencing now is what we will be living with—indeterminately. While we are all vulnerable to using the future as a way to help us get through the present, we also need to be aware that exclusively relying on the just get through it mentality has real-world consequences for our everyday well being . . .
Our everyday is now—not later. Perpetually delaying the value of our present means we risk meaninglessness and burnout. A grin and bear it attitude might allow us to temporarily free ourselves and others from making sense of our overwhelming challenges, but this approach also creates additional suffering because what we are experiencing in the moment is left without the attention it deserves. When this happens, we become vulnerable to other’s leftover understandings of our experiences. For your sake, I can’t wait until this is all over. Well-intentioned comments such as these remind us that we are where no one else wants to be. But after people walk and drive far away from our situations, we are still here—in it. Other people will not make meaning for us. They will not find value in our experiences. They don’t have to—yet. They don’t need to—yet. We have to—now. We must—now. Or we risk getting stuck in others’ stale misperceptions that deny the very parts of everyday realities that we must inject with value, especially when they appear unbearable. Today can’t just be a means to tomorrow—it must have its own logic and purpose and value. Burnout is a side effect of not being able to talk about what we are experiencing without referring to next week, next year, or when things might return to normal. There has to be more to the value of today than the fact that it gets us one step closer to tomorrow. Unfortunately, even well-wishing friends and family can’t help us in this regard because we make everyone around us feel momentarily better when we camouflage our everyday challenges in a preoccupation about the future. Yet, choosing not to make sense of our painful experiences now means we are choosing to minimize the value of what we are currently experiencing. Committing ourselves to making deep meaning about the experiences we are going through now—not just the ones that make others feel comfortable hearing—means rejecting the fictitious logic of progress in an attempt to reclaim some semblance of control. When we begin naming our experiences as real, we bring our everyday challenges out of the shadows and into full light to be noticed and appreciated and valued. Choosing to begin talking with those closest to us about the challenges and suffering associated with our experiences allows us to begin making sense of our everyday with those we love, instead of pushing them away with false justifications of when I get better, later, not now. This means beginning difficult conversations. Risking awkwardness. Knowing that later and soon are a type of irresponsibility that doesn’t affect only us but also impacts those that we love who need us to be active participants in the ongoing process of making sense. Making meaning in the midst of suffering is not easy. Our culture reminds us daily that making sense of where we are—not just waiting until we get where we so desperately want to be—will make others uncomfortable. Creating value about our authentic experiences asks us to reject the getting through this mentality and give voice to the very realities that are going through us. Of course, here’s the challenge: well-intentioned outsiders don’t need to make sense of their everyday—we do. We can no longer wait for permission. We can no longer delay the urgency of our daily lives in hopes of waiting until we get through it. Meaning making is our responsibility and opportunity. It can no longer be postponed if we are serious about creating the values that will guide, comfort, and sustain us in our ongoing care experiences. Who wants to visit someone in a hospital? Too depressing, right? Who feels comfortable walking into the home of a friend or neighbor who is chronically ill? Too awkward, right? Who knows what to say or how to act around a work colleague whose preterm child just died? Too personal, right? This is how modern life works. When things are going well—people are around. And when life becomes strange, fractured, interrupted, inexplicable, messy, uncertain—others willingness to engage silently evaporates. This doesn’t necessarily happen because people are bad or mean or even insincere (even though it often feels this way). So, why do we often feel like the people we expect to comfort us too often disappear into the background when we most need them? We have a cultural care problem that too often leaves us unprepared to comfort those in need. Throughout our lives, we are taught (and rewarded) for celebrating ongoing and never-ending change. In the world of commerce, we are constantly being told we need to buy this or get that so we can become something different or better. In the workplace, we are expected to constantly improve and our performance evaluations are based on proving how much we’ve done, accomplished, and changed over the past year. Even in our most intimate of relationships, we ask those nearest to us to constantly change . . .
Our culture tells us that acceptance is always synonymous with settling and resignation. So, is it any surprise that our preoccupation with constantly changing ourselves and others has become memorialized into common sense . . . Engaging with others should always come with conditions. Change is always possible and within our control. Acceptance and satisfaction means settling and settling is a sign of failure. Our collective faith in perpetual change gives us a place to focus our attention, dreams, concerns, worries, needs, and hopes. But an exclusive preoccupation with change also makes it difficult to know how to act or what to say or how to be when we are in the company of someone whose life situation calls forth acceptance—not change. When we are asked to be with the person in front of us, not the past version of that person, not the future possibilities of that person, not the person you need him to be, or even the person you want her to be—but the person next to you, yes, that real person—is it any wonder too many of us become overwhelmed and rendered incapable of connecting? What do I say? What can I say? What would I talk about? What can we possibly have in common? I don’t want to be rude, but what can this person do for me? Where will this conversation lead? Why would I connect with someone and risk getting close when there’s no way to predict what tomorrow will bring? I just want more, what would I have in common with someone who doesn’t want that? Nowadays, genuine, deep care requires a corresponding type of rejection. In accepting the person nearest to us who is in need, we also have to reject the habit of looking through people to find a glimpse of our future, as if the people we are with are simply a means to something better. 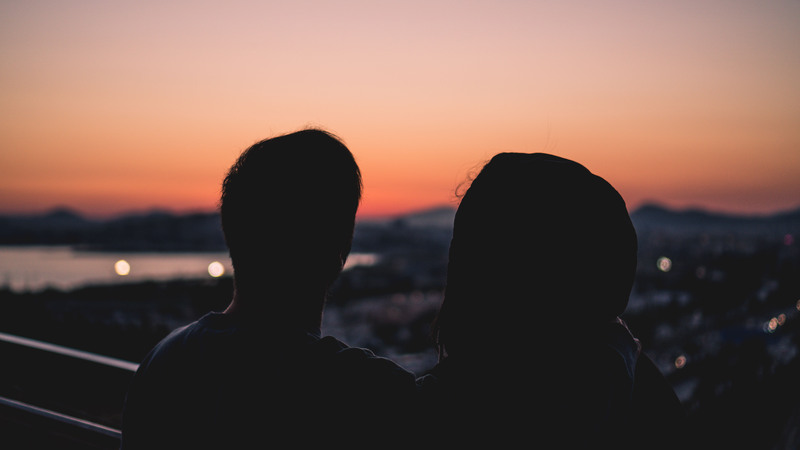 Accepting another person without conditions can be blinding because it asks us to be with another without the protection of talking about what isn’t happening, what should be happening, and what we want so desperately to happen. When people ask you why you are a caregiver, or question how you have been able to care for a loved one for so long, or why you are such a good friend to others in their times of need, what they are really asking is how can you possibly engage another without the filter of change? While most people are obsessed with persuading others to become and do something other than what they are now, they miss what we have trained ourselves to appreciate. On the other side of change is a frame of acceptance—a radical way of being with another that invites dimensions of deep connection. When reaching toward others, what would happen if we gave ourselves permission to connect without the expectation that the person in front of us need be anything other than who they are—now? This simple but profound orientation might just be the invitation to connection that reminds us—and them—that not everyone leaves when need rises up. You feel alone. Exhausted. Calm one moment and overwhelmed the next. Certain that you could never have prepared for what you are now experiencing. You want to reach out and find comfort—but how and to whom? Before long, the desire to find someone who understands is replaced by the belief that no one understands and no one needs to understand what you are experiencing. Physical emergencies call for immediate action, everyday needs are messy and ambiguous. Our culture plans for emergencies. We drill. We talk about how we might respond. We strategize about whom we might call and where we will meet. Emergencies call us all into action—out of our everyday routine and into response mode that is singularly focused. Chronic care and relational needs, on the other hand, just don’t work that way. Ongoing challenges are messy because they are often invisible and unknown to others. They don’t call attention to themselves unless we call attention to them ourselves. Who wants to be their own PR person for our privatized feelings and angst? How many of our everyday struggles and doubts and uncertainties get lost right here—in this moment, when we censor ourselves because we mistakenly believe that since what we are experiencing isn’t necessarily an emergency, it shouldn’t be shared, can’t be shared, won’t be understood, and won’t be cared about? Unlike an emergency, when it comes to our everyday needs, there is no universal audience that will immediately get what’s going on. We have to create our own audiences when it comes to sharing our everyday needs and that requires choices and effort and too often . . . silence. We don’t have a siren. And if we did, people would probably tell us to turn it off because our concerns don’t have clear beginning and ending points—they linger, taking their own time, disrupting our lives in ways that defy speed and closure and containment. Emergencies ask us to get out of the way and find help. The sharing of everyday needs calls us close and always changes everyone involved. An emergency, by definition, necessitates immediate action and response. Most of us respect the nature of emergencies by getting out of the way so professionals can do their thing. They know what they are doing—we don’t. Everyday, chronic needs don’t ask us to be spectators—they implicate everyone involved and require us to be in the way. When we seek to share our own concerns, those closest to us become implicated. There are no spectators because we are really talking about ourselves and those closest to us. Our vulnerabilities. Our fears. Our biases. Our expectations. Our histories. Our futures. Our reputations. Our relationships. Flashing lights and screaming sirens don’t accompany our chronic needs. No one pulls over for them. No, these ongoing challenges are quietly integrated into our relationships. Hinted at. Teased out in subtleties and reserved for those we most trust. “Not worthy of a ‘like’ on Facebook.” Ever farther outward. “Not appropriate for dinner conversations.” Ever farther outward. “Not fun enough to talk about when out with friends.” Ever farther outward. “Too revealing to open up about at work.” Ever farther outward. “Leaders are supposed to show strength, not vulnerability.” Ever farther outward. “Don’t burden them, they’re your kids.” Ever farther outward. “Not now, it isn’t the right time to bring it up.” Ever farther outward. “I don’t want my family to worry.” Ever farther outward. What would happen if amidst the sounding screams of sirens, we also paused long enough to listen to the whispers of the everyday needs and concerns of those nearest to us who don’t call out to be saved, but to connect? Don’t just pull over, listen closer. Our most important life decisions aren’t about what we do. They are about who we focus our attention, efforts, time, and care upon — our audiences. The following is about as close to a social law that exists — we eventually conform to and merge with those we are near, day in and day out. Yes, it’s so difficult to notice the impact of our audiences upon us because the values and beliefs and ways of talking and being with those nearest to us can’t help but become our world and define our perspective. For caregivers, our audiences — your mother, father, child, spouse, friend — don’t need to persuade us when they seep into us. They don’t need to cajole us when they surround us. Their worries become ours. Our worries become their worries. Then, without notice, our everyday and ongoing interactions with them shape the way we believe the world works and, perhaps most importantly, the ways in which we believe the world should work. That’s what makes us so unique — and misunderstood. Others seek audiences that promote advancement and opportunity. Moving up the corporate ladder or impressing our friends at a party are legitimate reasons for attachment to particular people and audiences. Doors open. Opportunities are made. Contacts are established. These are all valid and important reasons for sociality. But the caregiving experience is so often misunderstood because most others can’t fathom why we would spend our time with those who promise us nothing other than who they are . . .
No, really. Why would you do that? Can’t you find someone else to be there? Doesn’t it depress you to spend your time with someone who is . . . These aren’t mean questions — they are simply the questions asked by those who can’t understand that there is value in our care relationships with those stripped of title and power and prestige by their illnesses and vulnerabilities. It is a radical statement to engage in a relationship based not on what we might gain, but on what it says about the person we care for and our values. A relationship beyond advantage. Beyond strategy. Beyond expediency. Not a relationship based on what it might lead to or what it might represent. A relationship based on what exists – now. Our care associations say something more eloquent about what we believe than we could ever put into words. Our care means we are willing to engage in relationships that don’t necessarily guarantee us comfort. Or assuredness of appreciation. Or deep understanding. Or peace of mind. Or reciprocity. And yet, we still care. These days, I no longer listen much to what people tell me about who they know or whom they associate with that they believe will impress me. I look for character where few others pay much attention. I don’t look at people as much as I look to whom they keep company with. Show me someone who cares for another without notice or acknowledgment or prestige, and I know this is someone I want to keep company with because we know something most others haven’t yet learned. The most important relationships in life don’t necessarily lead to anything — they call us to be something that we didn’t know was possible. It’s not just what we stand for — it’s who we stand near that matters most.